I had never heard of Gosh before I picked this up last week. I hear it's more popular over in Europe than it is here. 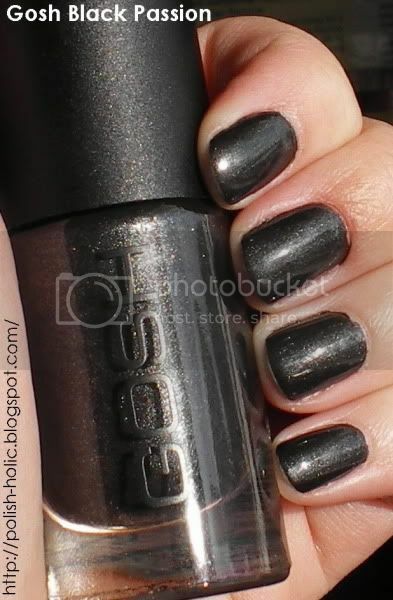 Anyhow, this is a black jelly polish with silver shimmer. Generally it looks like a very soft black (as termed by Sarah the best friend) or a dark dark grey. Application was a little bit thick and the brush was a little short with a bulbous lid. But nothing as bad as the uber short stem from wet n wild's Craze collection. As the polish was a bit thick, it took a little bit longer to dry. Overall, good polish, I like it. It was $6 at my Shopper's Drugmart. Broke my heart though, day after, there was a sale on Gosh cosmetics.